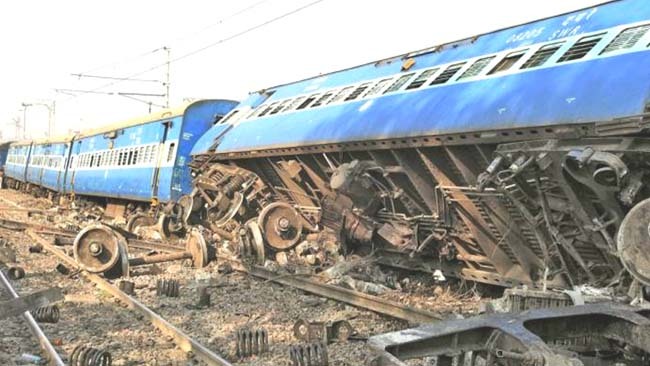 New Delhi, Feb 3 (IANS) At least seven people were killed and 27 others injured when 11 coaches of the Delhi-bound Seemanchal Express derailed on Sunday in Bihar's Vaishali district, officials said. Railway Ministry spokesperson Smita Vats Sharma told IANS: "Eleven coaches of the Seemanchal Express derailed at 3.58 a.m. near the Sahadai Bujurg station." She said that three teams of the National Disaster Response Force (NDRF) were carrying out rescue and relief operations and an inquiry has been ordered into the cause of derailment. The inquiry will be carried out by Commissioner Rail Safety (Eastern Circle) Latif Khan, Sharma added. According to Railway officials, three of the 11 coaches of the train that runs between Bihar's Jogbani and Anand Vihar in New Delhi, have been damaged. The prima facie cause of the accident was said to be due to a rail fracture at a crossing, the official added. Rajesh Kumar, Eastern Central Railway spokesperson, said that train resumed its journey towards Delhi at 9.50 a.m. with about 1,500 passengers from derailed coaches who were adjusted in 12 front coaches. An additional 11 coaches will be added to the train at Danapur near Patna. For those passengers who do not wish to continue their journey, arrangement for refunds has been done at different stations, Kumar added. "Railways would give ex-gratia of Rs 5 lakh each to the kin of every deceased. Rs 1 lakh would be given to the grievously injured and Rs 50,000 to those who suffered simple injuries. All medical expenses will also be born by the Railways," his Office tweeted. In another tweet, the Office said that the Minister was in touch with Railway Board members and General Manager East Central Railway regarding the accident. Bihar Chief Minister Nitish Kumar and Deputy Chief Minister Sushil Kumar Modi condoled the deaths. The ECR has issued helpline numbers.